The other day a friend of mine asked me what was left to do on my Bucket List and I struggled to answer her! I have done so much that I cant remember what’s left! 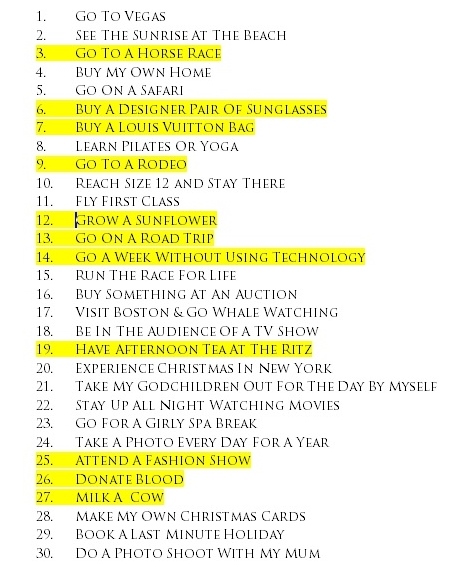 So I thought I would show you a list of what is remaining on the list! Everything that is in yellow has been done and crossed off……I still have 18 things left to do & 4 years to do it and I have some ideas for a few of them, I just need to start planning and putting into action! So far this year I have already crossed off 6 things & I have another one planned for next week – its all coming together slowly!